When I first met Chef Keizo Seki, he was an unheralded chef struggling to fill his restaurant even on a Saturday night a nondescript restaurant in West LA called Sushi Zo. Since then he has cemented his reputation as one of LA's premiere sushi chefs and opened a second restaurant in Downtown LA. 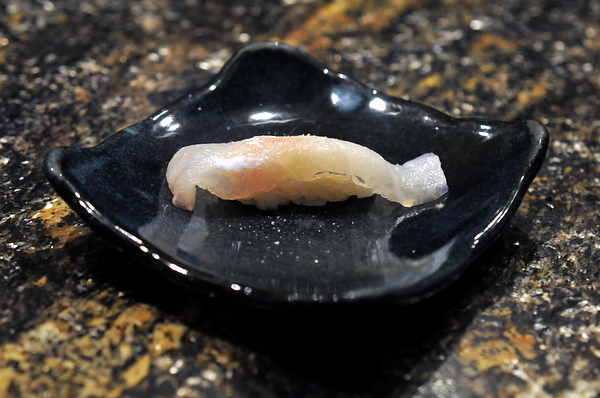 Both restaurants offer similar nigiri focused omakase with a couple appetizers to start. 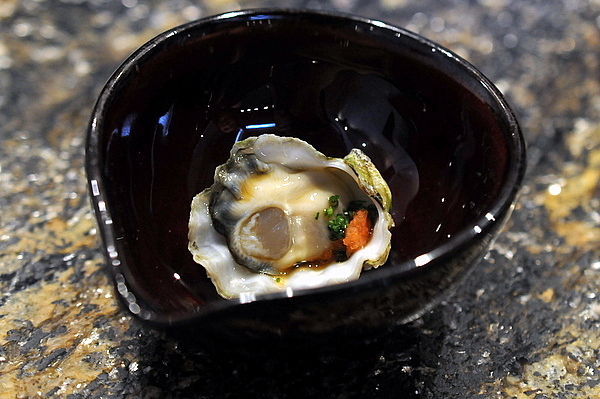 This oyster displayed all the charms of a classic Kumamoto, the sweet creamy core and tender foot muscle are brightened with the tangy zip of the ponzu. 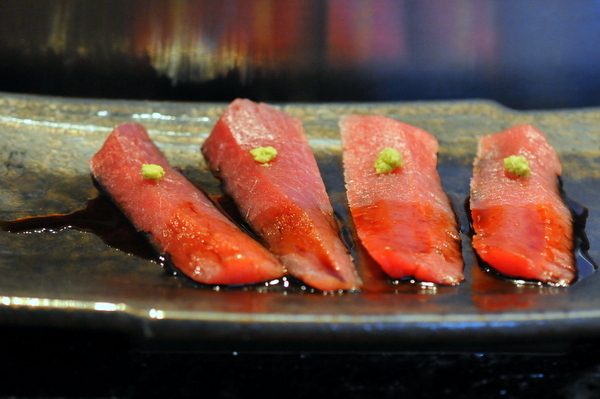 Most high-end sushi restaurants serve Bluefin but in a slight concession to sustainability, Keizo has opted to serve Meibachi instead of Hon Maguro. 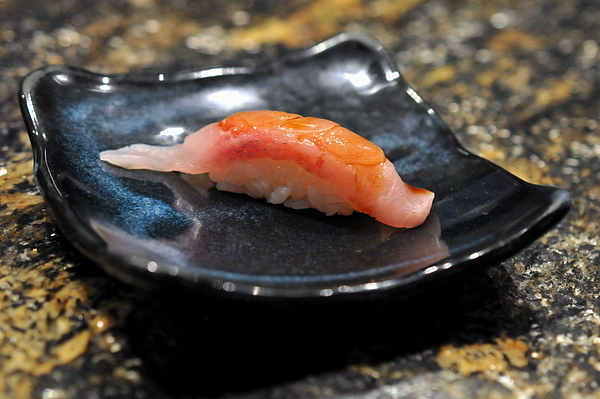 Lighter colored then its more prized cousin, the fish had an unexpected butteriness rather than the clean purity of lean Bluefin. A leaner firmer example of abalone, the mollusk had a mild but ever-present salinity tinged with earth. 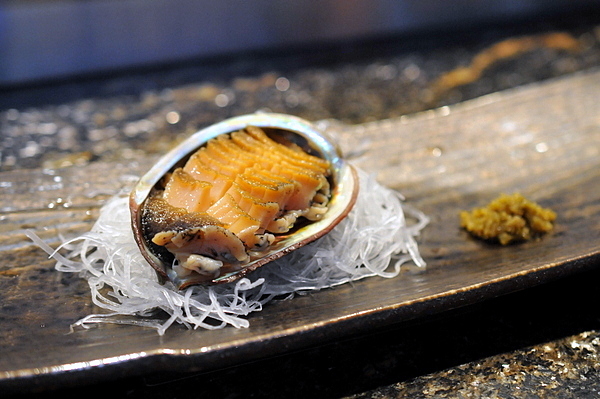 The side of yuzu kocho lends the shellfish a dark citrus spice, though the abalone was enjoyable au natural as well. 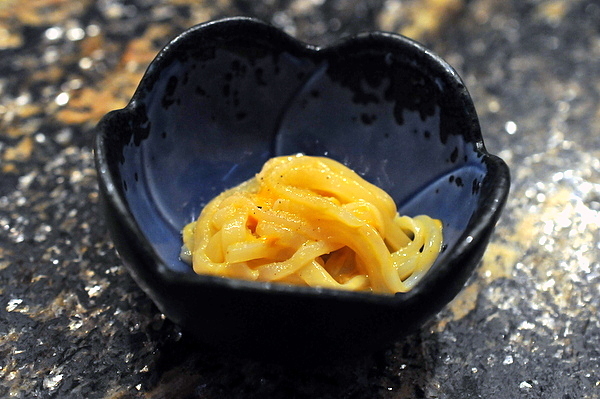 The last of the appetizers consisted of thinly sliced raw squid that vaguely resembles somen noodles. 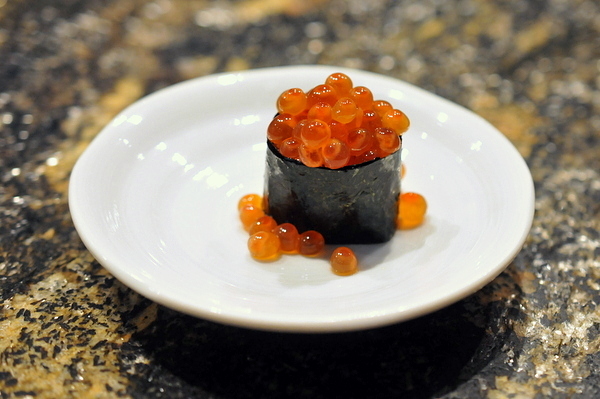 The Hokkaido specialty comes drenched in a sweet sauce of sea urchin cream topped with a musky dusting of truffle salt. The first sashimi was a lean cut of snappy halibut, the pale translucent flesh didn't have much flavor but reflected the lemon and salt it came seasoned with. 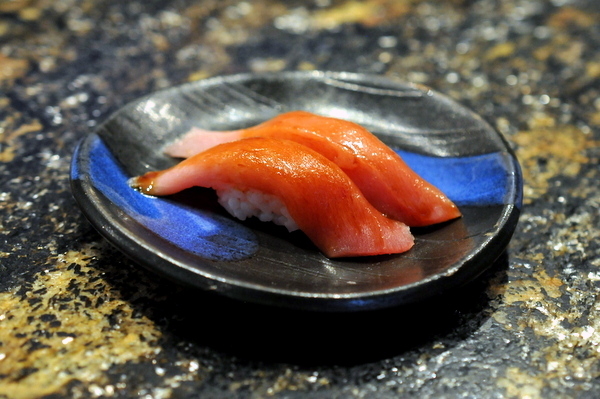 The raw Albacore proved to be one of the evening's standouts. The delicately segmented fish came drenched in tangy ponzu, the perfect counterpoint to the sweet buttery alabaster flesh. 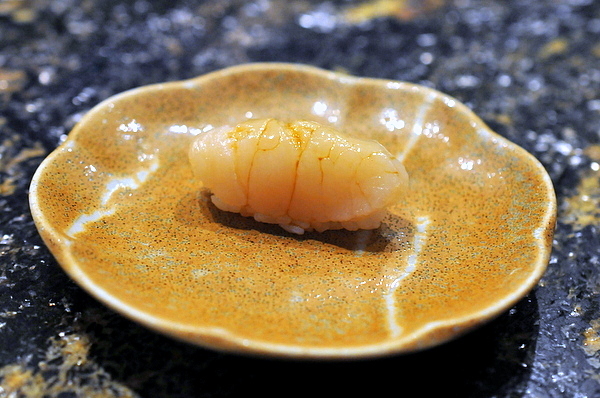 Quintessential fresh scallop, the thick slab of shellfish exudes sweetness tempered by the application of acid and soy. 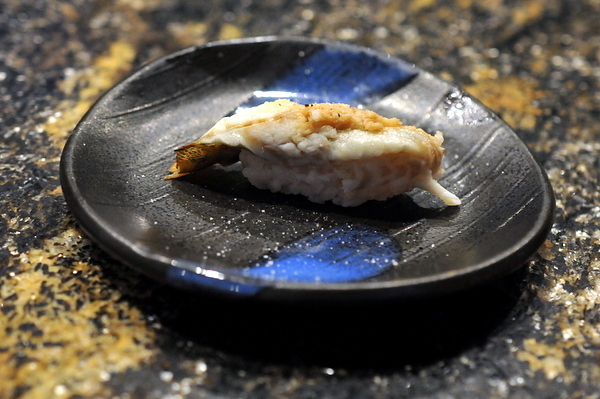 Next up was a pristine piece of Aji, the fish has a jelled fleshy texture and unabashed oiliness tempered by the spicy bite of the grated ginger. 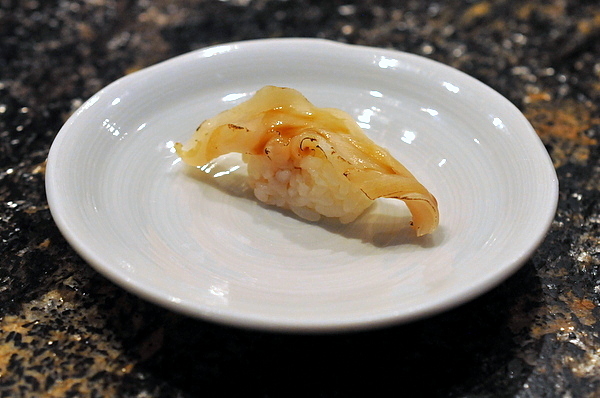 Though I'm not complaining, Zo always serves two pieces of toro instead of one like all the other nigiri. Though only the middle grade of toro, the meat still felt immensely soft and buttery with a heady oily twang to it. 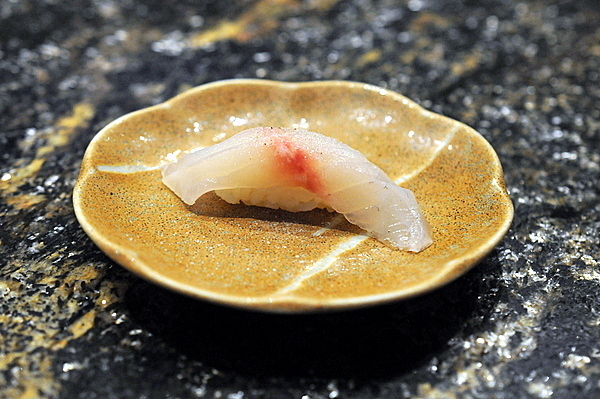 The beautifully pristine piece of uniformly colored amberjack had a wonderful nuanced fishiness on the attack that faded once the yuzu kocho came into play. This was a softer creamier presentation of sweet shrimp. 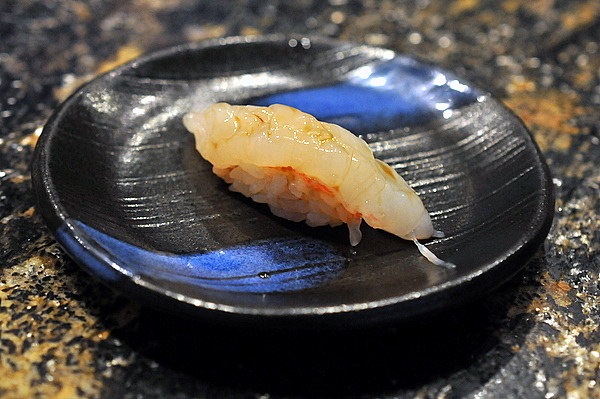 For my part I prefer Amaebi with a lean crunchy texture over the soft tacky mouthfeel of this example, but the sweetness was a nice change from the metallic flavor that often accompanies leaner shrimp. Almost unheard of when I was first getting into sushi, Akamutsu has become more popular the past yar or so. The fish's high fat content lends itself well to searing and the subsequent subtle smoky interplay. 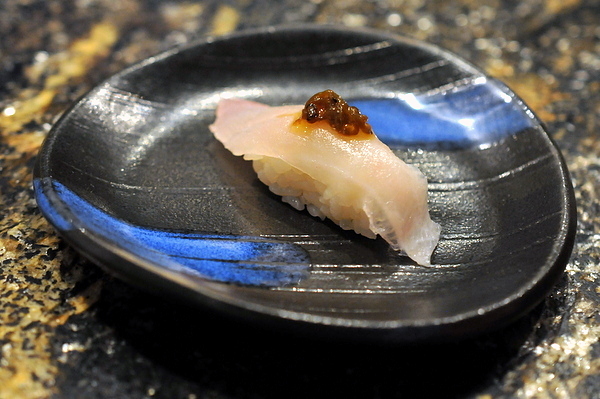 My first experience with Kurodai was at Zo I've had a soft spot for the fish ever since. This was a relatively lean expression of the fish with more subdued flavors which worked quite nicely with the flourish of truffle salt. 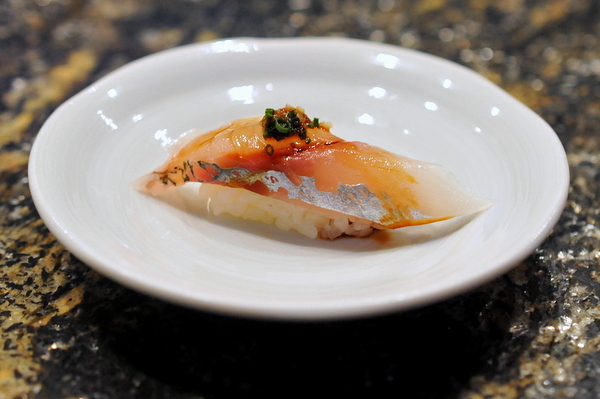 The chefs at Zo put a little twist on the traditional Mirugai. A quick kiss of the torch adds a touch of woody depth and softens the texture giving it a slight chew as opposed to the typical crisp snappiness. This was a classic expression of snapper, the fish has a brisk crispness while the combo of salt and citrus is particularly apparent against the fish's intrinsic mildness. 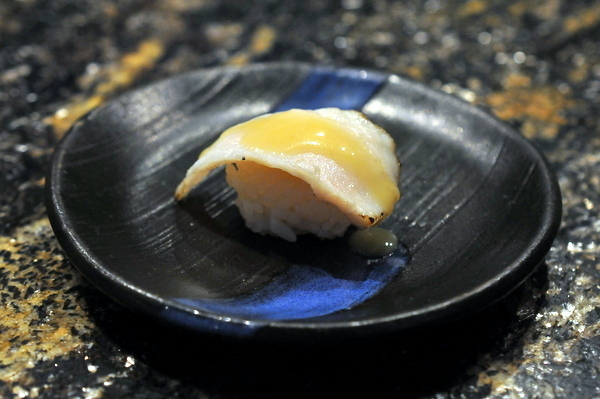 My first experience with Black Cod was at the original Zo and its been a consistent companion. 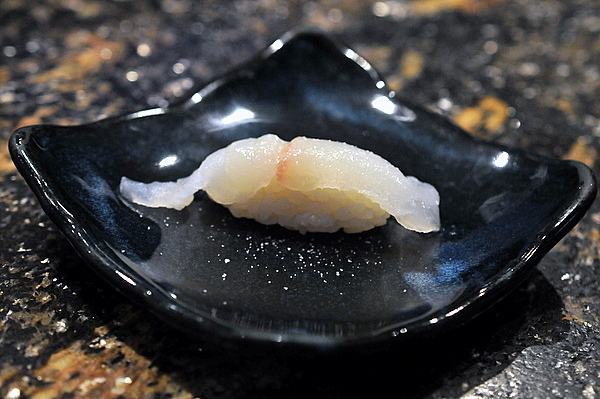 The cooked fish has a buttery heft and delicate supple flakiness. 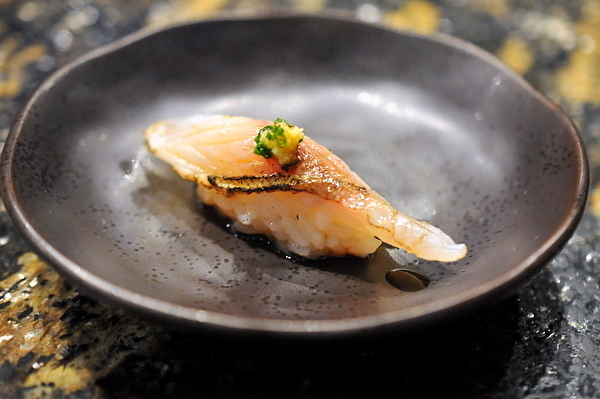 The white miso adds a honey mustard like twang that rounds out the smoky heft of the fish. 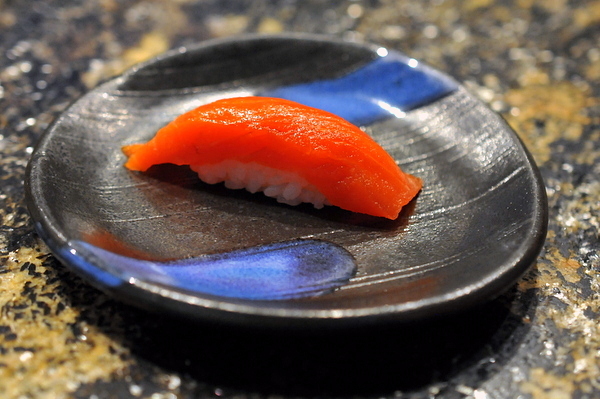 Textbook San Diego Uni, the lush roe was perfectly chilled and exuded a rich chilled creamy sweetness. 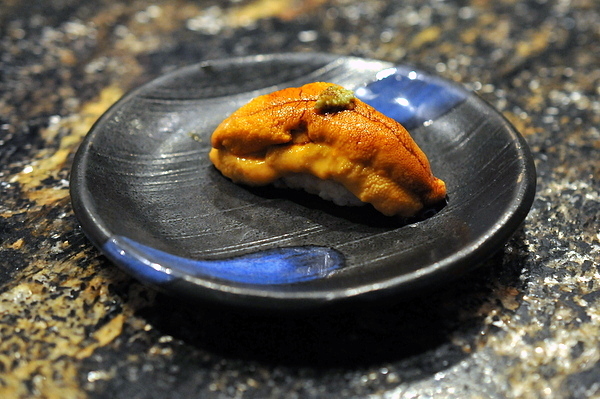 As always the uni is followed by a gunkan roll topped with salmon roe. The beautiful orange orbs are filled with a umami and smoke laced brine that takes on a slightly sweet cast with the rice and seaweed. 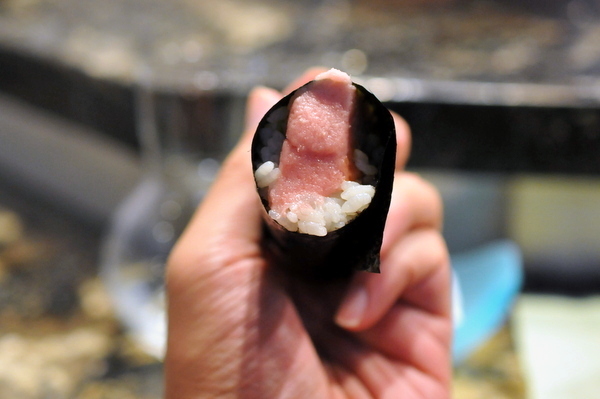 Kamasu is consistently a highlight of any sushi meal. This was a bit leaner than most with lots of bitter char upfront and a bitter astringency from the ginger. 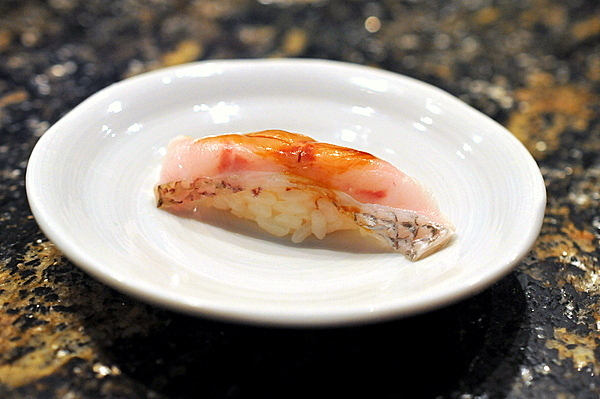 Another favorite of mine, Shima Aji has gone from a relative rarity to a staple of every high end sushi spot. 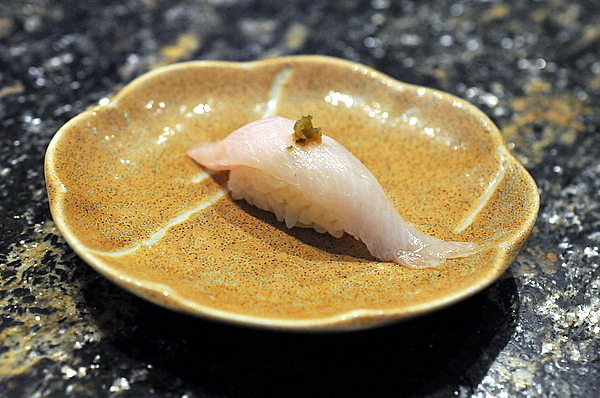 The fish has a sensual jellied texture and complex oiliness. The grilled shishito topping was an inventive compliment, vegetal smoky and a touch of pickled tang. The Kinmedai is the most full flavored of the snapper varieties with a pronounced marbling threaded through the pinkish translucent flesh. The jellied texture and decadent oiliness goes beautifully with rich savor of the soy. The Alaskan Salmon was one of the most lackluster pieces of the night. Certainly better than the typical run of the mill salmon but it felt boring compared to the rest of the meal. 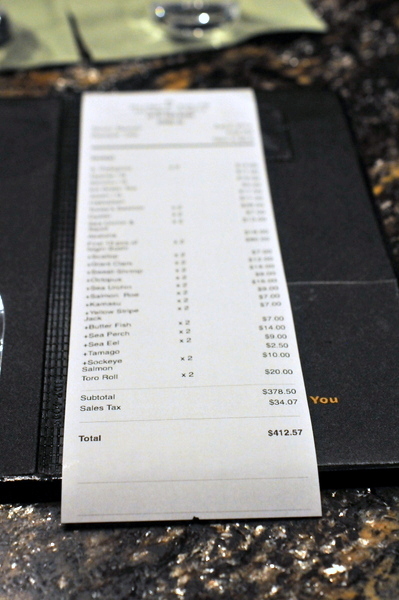 The formal omakase dispensed with, we decided to add a few supplements. First up was an immensely tender meaty octopus laced with a darkly sweet syrup. I was hoping for a raw octopus, but the delicately steamed preparation certainly had its charms. I always have mixed feelings when the anago arrives as it typically heralds the end of the meal. 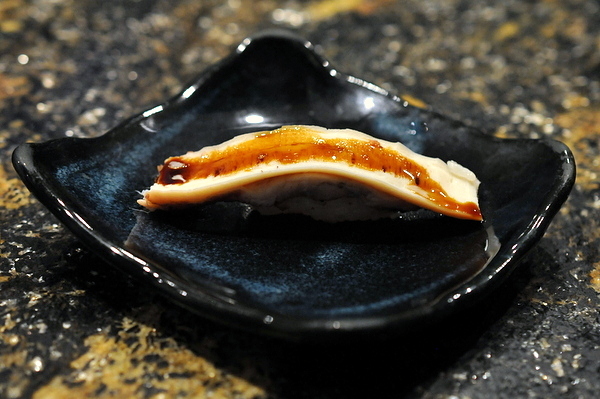 Zo echews the typical sweet eel preparation in favor of an earthy dusting of truffle salt. Zo isn't known for its rolls but like most high end sushi spots, the restaurant does offer hand rolls to fill in the cracks. This was little more than fish rice and seaweed. Personally I would have liked to see some scallion or radish, some wrinkle to add character to the roll. 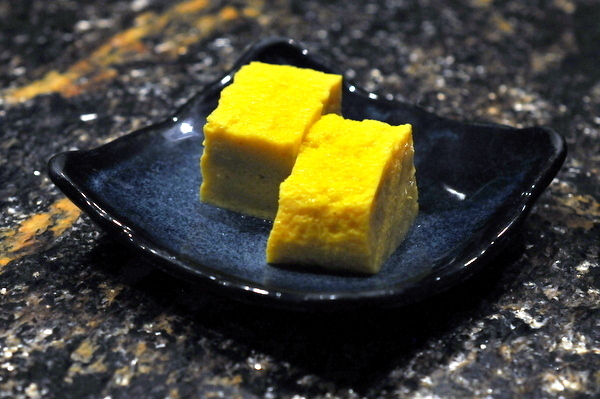 The meal ended with a prototypically hammy tamago saturated with sweet syrup. 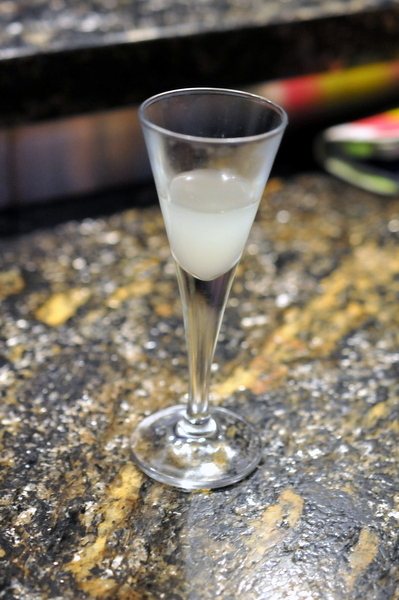 As always the meal ended with a shot yuzu juice to close out the meal. The sharp sweet & sour tang cleans the palate beautifully. As always the food at Zo was spectacular and I consider the restaurants my favorite in LA for pure sushi. If I had to find one fault with Zo its the lack of change in the omakase menu. While I could understand how people would hesitate to pay the $150+ tariff more than once, I have found every meal here well worth the price.